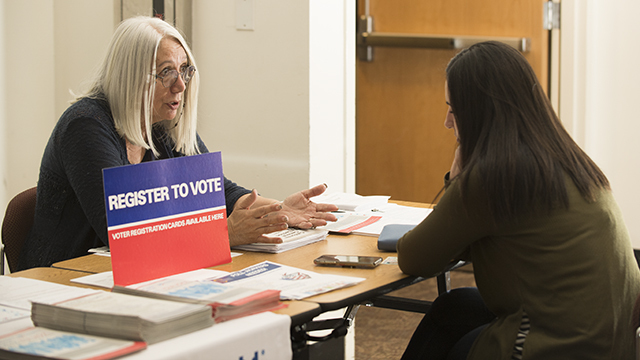 Cindy Reul of the League of Women Voters talks a student through the process of registering to vote during the Election Fair. A new center at Cal Poly Pomona will offer students an opportunity to take a deeper look at important issues facing Californians. The California Center of Ethics and Policy (CCEP) was launched with the financial support of a university emeritus faculty member and will be fully operational in spring 2019. The CCEP held its first event on Oct. 9 – an election fair that included a voter registration drive and representatives for and against propositions on the Nov. 6 ballot. Philosophy Professor Michael Cholbi, director of the CCEP, said that while many universities have similar centers, Cal Poly Pomona’s is distinct in that it focuses on ethics and political issues in which California has a role to play. The center plans to tether its program to a different theme each year. For the 2018-19 academic year, the focus will be on healthcare access and healthcare justice. The 2019-20 session will grapple with war and the military in California culture and the economy. Components of the program include a semester-long three-unit advanced seminar, in which students must apply to be fellows, and a student conference that will feature original research. Experts also will come to campus to give public lectures related to the seminar’s focus. Last year, a donor approached Sharon Hilles, the former dean of the College of Letters, Arts & Social Sciences, about creating an ethics center that would deal with issues that affect Californians. Iris Levine, the college’s current dean, was serving as associate dean when she and Hilles discussed the possibility of creating the center after the success of the philosophy department’s Ethics Bowl competition. The center will offer opportunities to enhance student success, community engagement, social and environmental responsibility, and civic engagement, as well as bolster the university’s academic reputation, Levine said. “I believe that in a very short period of time, the university will be known for the work happening at the California Center of Ethics and Policy and that we will be looked at as a beacon for discovery and discussion with respect to issues that directly impact the citizens of California,” she said. Philosophy Professor David Adams, who will teach the first seminar, recalls that his department previously had a less formal and not as well-funded Institute for Ethics and Policy that was disbanded in 2009-10 because of budgetary cuts. The new center will be more robust in what it offers, Adams said. “This a game-changer because we can do things with the center we weren’t able to do in previous years,” he said. Adams’ seminar will look at the moral and social issues surrounding healthcare, such as how it should be distributed, who should and should not get access to expensive medication, and whether universal healthcare is a viable option in California. Students are invited to apply to the Ethics and Policy Fellows program. The application for 2019 Fellows is Nov. 1. Visit http://bit.ly/2zQfjEC for more information.